Mansfield cabinet 35 looks like it holds the crown of being the first cabinet area we have spotted which has the combination VDSL2, G.fast and FTTP services. 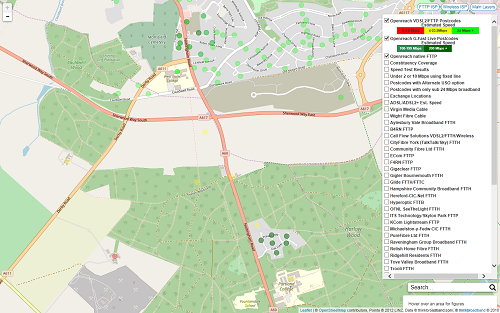 The VDSL2 covers a footprint around 2 km long from Robin Down Lane down the A60 to Oak View and this likely explains why we are seeing two ultrafast technologies deployed. We initially spotted the G.fast pod deployed which of course only brings ultrafast speeds (100 Mbps and faster) to those within a short distance of the green copper cabinet that the pod is attached to (distances vary depending on local conditions but a rough rule is G.fast is likely to be available if within 350m of cable distance). The latest change on Monday 19th November was a cluster of native GEA-FTTP availability for properties around Oak View near Harlow Wood. Unfortunately this has created an ultrafast dumbell effect where some premises in the middle still only have VDSL2 available and while many will get superfast speeds there are some heading down the A60 Nottingham Road where sub-superfast speeds are the best we expect them to get. The FTTP service does not go via cabinet 35 or the VDSL2 twin, but the fibre will likely pass close by on its way from the aggregation node which was installed as the VDSL2 roll-out took place in Mansfield. These nodes are located so that they will cover around 1,400 premises with FTTP assuming a full FTTP roll-out so for urban areas this will usually mean an aggregation node roughly every 5 to 6 cabinets. The point to point fibre for the VDSL2 cabinet is routed via the aggregation node and the G.fast cabinet takes it fibre feed from a spare fibre at the VDSL2 cabinet. The de-linking of the FTTP aggregation nodes from the actual cabinet infrastructure means that in perhaps 8 to 15 years when a big copper switch off is underway that there will be scope for removing some of the street furniture and no disruption to the full fibre broadband services. It will be interesting to see if this pattern does repeat elsewhere and whether in more urban scenarios if the middle slower belt can be avoided. Interesting,i've seen plenty of fttc/gfast but not vdsl2/gfast combos. You do know that FTTC = VDSL2? WOW! It would be nice top have the option of any of these services in Central London. As it is ADSL service is actually getting progressively worse for me. If I need fast downloads then O2's 4G service via my phone is 10 times faster (and more expensive) than ADSL. Of course, I pay the same for my ADSL service as someone getting a vastly superior service. Good spot, and good to see. And it appears to be all BT commercial investment! Nice to see BT's models adjust to permit this. What does an aggregation node look like? Prescot exchange is one of the new 81 G.Fast / FTTP areas and thought I may have a wander around to see if I can spot one. Are the locations available? NeilB1 At a rural site, simple one it has a minimum of 256 fibres in a cable into a splitter located in a manhole and several smaller cables - typically 24 fibre count head towards different cabs deeper in the network. I have seen in other rural territories secondary splitters being used to add FTTP clusters where FTTC is out of range. The aggregation node connects back to a nominated handover point (c 1,200 nationally) -a large existing exchange. Most rural exchanges are 'glassed' through. NeilB1, you won’t be able to see it. It’ll be in a jointbox underground. A good guess would be a newer looking double lidded jointbox near a fibre cabinet. Fastman - the rural territories are not UK, but there is no reason why it could not be applied her, given the spare fibre count all along the subsidised fibre paths. I am assuming it is only a matter of time this internally applied planning rule is changed, as Fibre on Demand requirements are eventually enforced to support native FTTP in-fill extensions.